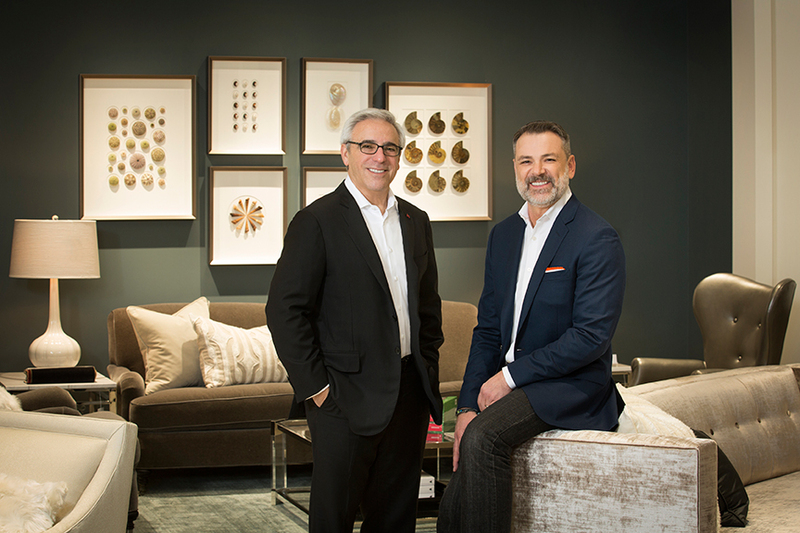 Mitchell Gold and Bob Williams introduce themselves and their new Frontenac store to St. Louis. SLHL: Why did you choose St. Louis as your newest location? Mitchell and Bob: Why not St. Louis? We want to be in all the fabulous cities in America. This is a really gorgeous city with beautiful homes and obviously has customers that would appreciate our style sense. Plus, we loved the location in Frontenac. It’s very intimate. SLHL: How does your design philosophy mesh with St. Louis’ design sensibility? Mitchell and Bob: We’re going to find out. Honestly, we have stores all over the county, and I think one of the things that has happened in America over the last 20-plus years is that TV shows are much more stylish now then they used to be. Back with Dallas and Dynasty, and now shows like The Good Wife, they are very inspirational to people all over the country. High style is not just in New York and L.A.; it is all over the country. We hope that St. Louis will love us. SLHL: What sets your furniture line apart from your competition? Mitchell and Bob: Our styling. Our quality. We control all the upholstery in our own factory in America. Our ecos. We’re very environmental conscious and responsible and have been since day one, not necessarily just the past few years when it has become more fashionable. Also, the value we represent. People look at our pricing and go “wow.” I think it’s all of those things. Bob and I love the symphony of making all these things work. SLHL: What words best describe your line? Mitchell and Bob: I think a lot of people have described it as a very American design sense versus a European modern. We also describe our style sense as being current. It is not necessarily traditional or modern or even eclectic. We really sort of take the pulse of what’s happening, whether it’s what we see happening in pop culture, movies, fashion or music. We really just try to create an environment that’s very much a pulse of what is happening right now. In five years people won’t look at our products and say, “Oh why did I buy that?” It will have a real lasting sense to it. We like things that have a nice, clean feel. In our mission statement, the very first sentence is "comfort is paramount." You know since day one Bob and I have been very conscious of comfort. We have sat in every piece here, and it has passed our "tush test." SLHL: What do you see as the hottest trends in 2015? Mitchell and Bob: We think that people are dressing a little dressier and as a result of that they are also making their homes a little dressier. One of the other trends we see happening is brass, whether it's bright brass or antique brass, coming back. We’re doing it in a different way than you saw before. We’ve worked really hard with various suppliers to find just the right colors and materials and incorporating them in so it doesn’t feel like the same brass you saw in the 1970s and 1980s.